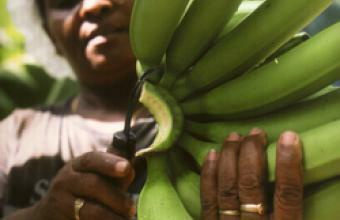 Over 90% of what we pay for tropical fruits like bananas never reaches the producer. The banana industry is symbolic of a wide array of issues affecting Latin America, covering unacceptable living and working conditions, repression of unions, environmental devastation, and unfair business practices. In fact, the term “Banana Republic” typifies such unstable, repressive and oligarchic Latin American states, dependent on the export of a single, low-cost commodity. Throughout much of its history, the destiny of Latin America has been tied to this fruit – the infamous United Fruit (known as Chiquita Brands International today) overthrew governments, violently quelled workers’ strikes, and even featured as an antagonist in Gabriel García Márquez’s famous novel One Hundred Years of Solitude. Yet this is not to say that such abuses are a thing of the past. Indeed the world’s biggest fruit companies are currently engaged in a race to the bottom, leaving working conditions, the environment, and fair pay by the wayside. Fyffes has faced several serious allegations from workers and activists. One such company is Dublin-based Fyffes International. In spite of the vast profits it has accrued as the world’s fourth-largest banana importer, it has repeatedly failed to safeguard its workers and their communities. It has been frequently alleged that workers have not been provided with proper safety equipment, leading to such incidents as the hospitalisation of 14 workers who were poisoned by toxic chemicals. Examples of such negligence are by no means uncommon, as the banana industry consumes more agrochemicals than any other industry, with the exception of cotton, with excess run-off often contaminating the soil, the water, and even the workers themselves. Labourers are often forced to work in these unsafe conditions for long hours in the blistering heat for less than minimum wage, with limited breaks, no toilets, no water, and no overtime pay. In fact, many workers risk being illegally forced to pay for transportation to the fields in which they work. Work on such plantations is often seasonal, meaning that the majority of these workers are forced to find employment elsewhere, or rely on subsistence farming for most of the year. Compounding these problems is the lack of union representation, largely due to intimidation campaigns that target workers with threats, violence and abduction. In a development that rings true throughout Central America, Fyffes exerts a virtual monopoly over the banana industry in Belize, as the country’s sole exporter. In the words of the British trade union GMB, “Fyffes is an appalling employer that cares nothing for its workers who toil in boiling heat to produce the fruit that makes the company’s profit”. Given these extreme abuses of power, LASC has long been a vocal critic of Fyffes and their business practices. In 2003 LASC and its supporters protested the Fyffes AGM in Dublin on behalf of Belizean workers, and presented management with roughly 2,000 signed postcards calling for an improvement in working conditions. LASC has maintained this pressure, supporting various boycotts against the company, including the ongoing labour abuse case launched by Honduran melon plantation workers due to unsafe conditions and suppression of unions. LASC is now calling upon Dundalk F.C. and its supporters to join those protesting against Fyffes, and cut ties and sponsorship deals with the company.